At the mere mention of spring, my husband pulls on shorts and my kids start asking when the outdoor swimming pools are going to open. 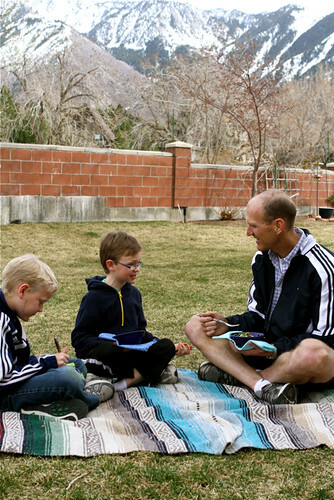 The mercury in the thermometer is creeping up (well…actually, the numbers on the digital weather station in the kitchen are increasing…modern day stuff, you know) and despite the snow that still blankets the nearby mountains, the kids are begging to eat outside. For our first outdoor picnic of the year, I wanted something easy. A dish we could scoop into bowls and cup in our hands as we nestled together on our threadbare picnic blanket sounded perfect. 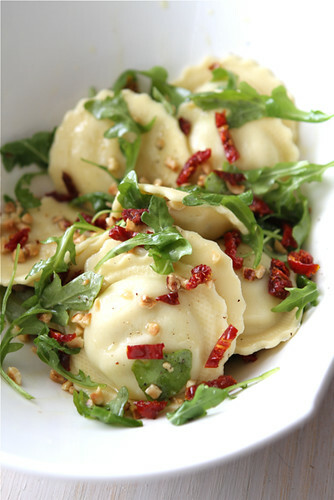 That’s how this quick and easy ravioli, tossed with sun-dried tomatoes, arugula and hazelnuts came to be. Dreaming up our first picnic meal of the season came rather easily. There was a supply of Monterey Gourmet Foods™ products sitting in my fridge, set aside for a day when I wanted something really tasty that didn’t require a lot of energy or brainpower to make. Thinking of what to make for dinner really is half the battle, isn’t it? With a base of Roasted Chicken and Mozzarella Ravioli to work from, the pieces started to fall into place without much effort. I could have easily tossed the ravioli with some of Monterey Gourmet Foods Basil, Almond and Pine Nut Pesto and some fresh vegetables for a delicious, healthy meal. However, pesto had been on the menu the night before and I wanted something a little different. There were a couple of handfuls of arugula left over from our meal of Baked Tilapia with Arugula & Walnut Pesto and Toasted Breadcrumbs that needed to be used. I tossed the arugula, some sliced sun-dried tomatoes, toasted hazelnuts and some olive oil into a serving bowl. Once the ravioli was cooked, having transformed into tender pillows of pasta, I gently tossed it with the arugula mixture. All that was left was garnishing the dish with freshly grated Parmesan cheese, dishing it out into bowls and carrying it out to Station Picnic in the backyard. Not only was this dish kid-friendly, but the flavors worked so well together that my husband and I decided we would proudly serve this meal at a dinner party with friends. With our focus on healthy eating, I am thrilled that Monterey Gourmet Foods adheres to their 8 All Natural Principles, which include a commitment to NOT using hydrogenated oils or artificial chemically manufactured additives, and ONLY using meat and dairy products from cows that are not treated with hormones or antibiotics. Bring a large pot of salted water to a boil over medium-high heat. Add the ravioli and cook according package instructions. Reserve 1/2 cup of the pasta cooking water. Drain the ravioli. 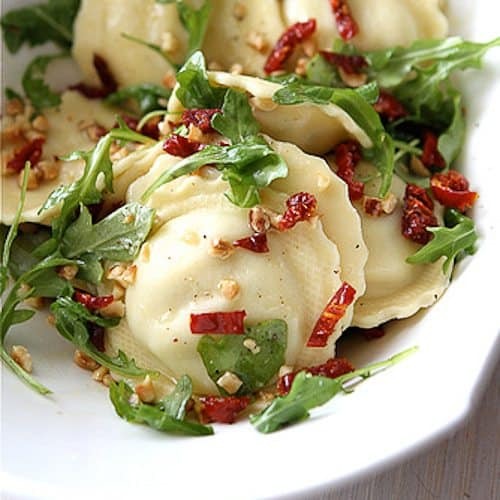 While the ravioli is cooking, stir together the sun-dried tomatoes, hazelnuts, arugula, salt and pepper in a large serving bowl. Drizzle in olive oil and gently toss to combine. Add the ravioli to the sun-dried tomato mixture and toss gently to combine. You may want to use your hands to avoid ripping the ravioli. Serve and garnish with Parmesan cheese, if desired. This sweepstakes runs from 4/11/2012-5/31/2012. Bring a large pot of salted water to a boil over medium-high heat. Add the ravioli and cook according package instructions. Reserve ½ cup of the pasta cooking water. Drain the ravioli. While the ravioli is cooking, stir together the sun-dried tomatoes, hazelnuts, arugula, salt and pepper in a large serving bowl. Drizzle in olive oil and gently toss to combine. Add the ravioli to the sun-dried tomato mixture and toss gently to combine. You may want to use your hands to avoid ripping the ravioli. I’d try the marinara, I guess, just because I love experimenting with marinara! They are so versatile and you can add whatever chopped veggie, herb, or meat into it and voila! Dinner! When I eat raviolis, I like sticking to lighter toppings and sauces too in order to let the ravioli flavor come out – these bowls of raviolis look awesome. 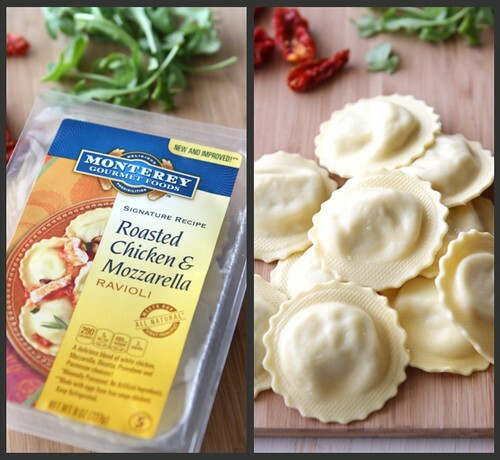 Raviolis have been one of my favorites since I was a kid and I’ve always relied on store-bought, so it’d be interedting to check out some of the Monterey varieties. I would probably use the classic marinara sauce. I feel that they would go together pretty well, I’m not really good at cooking pasta so I would go the old fashion route to be on the safe side! I want to try the ravioli with alfredo sauce! We had Monterey ravioli last night for dinner. I make a simple sauce with olive oil, garlic, red pepper flakes and lemon juice. Sun dried tomatoes would have been a great addition too. I love using their ravioli to bulk up salads or soups! I also want to make this recipe! YUM!! I would make tortellini & spinach soup. I also want to try this recipe! This looks absolutely perfect. I want to go on your next picnic!!!! The recipe for Pear Pesto Pizza on their website looks fantastic! I’d use the Rainbow Five Cheese Tortelloni to make a beautiful and colorful vegetable pasta salad! I would love to make tortellinis with red sauce! 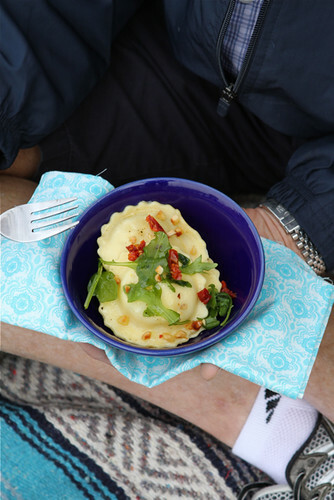 I would use the ravioli with a light butter/lemon sauce and some fresh spring ingrdients like aspargus, ramps, or peas. This recipe looks fabulous, easy and healthy. I’d definitely want to try the turkey lasagna – protein and carbs – fabulous combo! Thank you for sharing this yummy recipe! A really amazing combo of flavors, Dara. 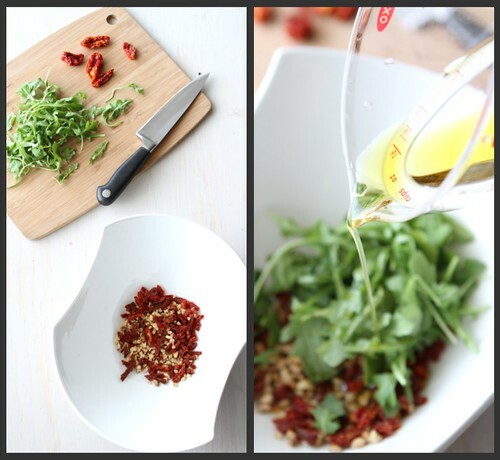 I love the peppery taste of arugula and try to sneak it into as many recipes as possible. I can just imagine how fabulous it was with this beautiful ravioli and the other ingredients. Well done. I would make vegetarian ravioli lasagna! I’d also go with the Rainbow Five-cheese Tortellini and toss it with basil pesto, pine nuts and chicken that has been pan-sauteed in olive oil and garlic with some dry white cooking wine poured over it once it’s done cooking. Probably add some shredded Parm or Romano, drizzle of lemon juice. Maybe add some sauteed veggies if I felt like it, too! 🙂 Served with homemade garlic bread, of course. I would make a Zucchini and Mushroom Bake with the Monterey Marinara Sauce. And, I would top it with Monterey’s Shredded Parmesan Cheese. Yum! Perfect summer dish. I’d try the shrimp and lobster ravioli with alfredo sauce, or a homemade lemon sauce of some sort. These products look tasty! I love pastas with pesto and veggies! Oh would I LOVE to dive into this plateful of carb bliss!! I would try their Bolognese Tortelloni and cook it in chicken broth and serve it that way–en brodo, as they have it in northern Italy. I would love to do the ravioli you did it sounds yummy!!! How timely, I’ve been craving ravioli lately! Fire roasted mushroom and four cheese ravioli sounds divine with some parsley pesto or Three Pepper Tortellini soup. Your photos make me wish I had some of that right now! So good. I’d love to try a simple ravioli dish. I’ve wanted to try making a ravioli “lasagna” and I think using their product as the ravioli base would be a delicious (and not overly-processed) way of finally trying that idea out! I’d love to try one of their raviolis! Hmm, too many options. I get mushrooms from my work on a regular basis, so I think the mushroom and 4 cheese ravioli with asparagus and extra mushrooms sound tasty. I’m bad with sauces so that part is yet to be determined. Butternut squash ravioli with browned butter and sage. 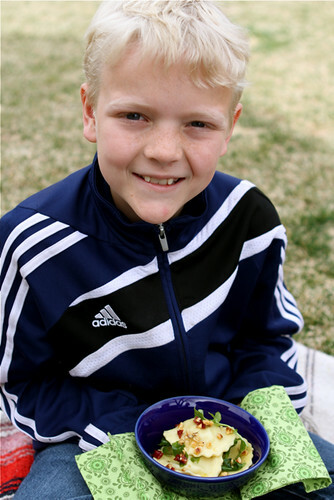 I love ravioli and I’m definitely going to try your recipe for my boys! The four-cheese ravioli sounds amazing! yum. I would combine it with fresh garlic, olive oil, and parm cheese and serve with overly done grilled asparagus. I would make Chicken Carbonara!! Chicken and sun-dried tomato ravioli with marinara…yum! going to cook this tonight! I think it’d be fun to layer up some of their ravioli, like a lasagna, bake it off and devore! I would love to use Monterey Gourmet Foods’ pesto sauce to make a chicken-pesto panini! I love ravioli anything, but right now I am trying different recipes with tortellini. Last week I made a 5 cheese tortellini soup with chicken and spinach. It got rave reviews. Experimenting is always interesting. Hard to go wrong. we would make caprese and ravioli! I would make a nice brown butter sauce for the ravioli. Yumm! Butternut squash ravioli with a homemade curry cream sauce or with Brown Butter Sage sauce. It would be delicious to swap out the arugula and hazelnuts for a little basil and pine nuts too for a little caprese style ravioli salad. Although those ravioli certainly look good enough to eat all by their little lonesome! I would make a baked ziti! Your boys are so cute! I do the ravioli thing for dinner too. So simple and so fast! Seriously a no brainer dinner. This looks so good! I would make a traditional lasagna but use the tortilini! Yum! I would just make this recipe. Looks good! That looks so fantastic! I cannot wait to try this recipe. The ravioli sounds delicious. What you made sounds like a good thing to try as well. What great flavors with this arugula! Love it… I hope you and your family had a fabulous EASTER! i would make a simple ravoli dish – probably w/ the butternut squash variety or the artichoke/mozerlla – and some seasonal veggies. I would make ravioli/tortellini /gnocchi with a creamy butternut squash sauce. This looks amazing! I’d definitely love to try this recipe. I’d love to try the gnocchi! I really like alfredo sauce so I’d want to try that! The lobster ravioli with Alfredo sauce sounds to die for. I would make that first and not count the fat grams! I would love to try the olive garden tapenade on crostini as a appetizer! I would use their pesto with pasta salad. yum- i think i’d try THIS recipe!! Honestly, I just really really want to make what you just did! That looks heavenly! And I have never even tasted a hazelnut before, but boy do I want to! We often have packaged ravioli in the fridge for a quick meal and I love what you did with it! 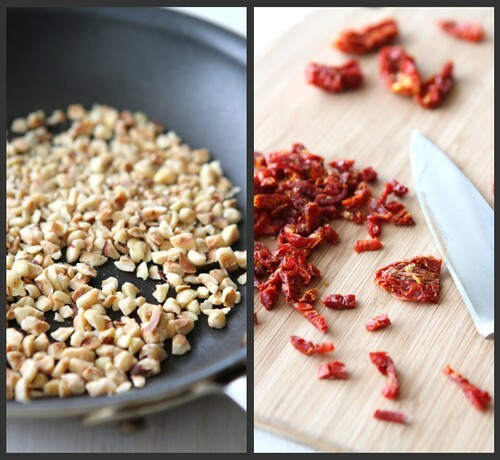 Sundried tomatoes and arugula are a fabulous and perfect go-to pairing, but I love the addition of crunchy hazlenuts! And what i wouldn’t give to try this Roasted Chicken & Mozz ravioli! Sounds so good! And how about tossing the arugula into a pan with a dash of olive oil and the sundried tomatoes just to heat through and wilt, soften the tomatoes a bit and stir in cream and a bit of parmesan to make a hot, creamy sauce? Maybe add a few roasted cherry tomatoes? Oh my now I am hungry! I love butternut squash so I would try their butternut squash raviolis. I would either eat them plain because I typically do that or I would make a brown butter sage sauce. I would make a creamy bacon and ranch ravioli! Shrimp and Lobster Ravioli sounds really good. Add some coconut white sauce and you have one amazing meal! Toasted ravioli, all the way! I would make the butternut squash ravioli. Yum. I would totally love to try the Rainbow 5 Cheese Tortelloni . It is BEAUTIFUL! I would cook it and simply shave some parm on top. Thanks!! id make a pesto pasta salad with their sauce! I would use the roasted chicken and mozzerella pasta as well. However I would make a cilantro/lemon/peanut pesto then thrown in raw cherry tomatoes at the very end! Yum! I would love to try their shrimp and lobster ravioli! Sounds delicious! I would make a tortelloni salad with their pasta. This sounds AMAZING!!! Thanks for sharing! My family would love the chicken! I would make the lobster ravioli with some lighter cream sauce. Simple and full of flavours, I featured it as Article of The Week (just thumb and link to your page) I hope you don’t mind. I’d make Tortelloni Sausage Soup with Monterey Gourmet Rainbow Five-Cheese Tortelloni. Thanks! This looks like a good company! I’d like to try the Smoked Mozzarella and Artichoke Ravioli with just a simple red sauce. Actually, I’d love to make this recipe!!!!! I would love to make your recipe and add some Frangelico Liquer to it. Thanks. I’d like to try ravioli with a pesto sauce. I’d make lasagna, kids love it. I’d like to make tuna pasta with it. Thanks for the giveaway. Yum! I love their natural principles. I haven’t made it in a while but ravioli lasagna is quick and so good, especially when you add in some roasted vegetables. Hi, I am not a very good cook that is why I don’t have a recipe to share with you , but I would love to make , Pear Pesto Pizza recipe from the Monterrey Gourmet Foods, Thank you. Love the combination of flavors offered here and the simplicity in preparation! I love to make minestrone with either tortellini or ravioli added at the end. I’D TRY OUT QUITE A FEW TO BE HONEST. BASIL MEATBALLS IS ONE SUCH. I would use the Chicken and Mozzarella ravioli and add sautéed asparagus and toasted slivered almonds and a dusting of parmigiano reggiano cheese. I’d pair it with a grilled romaine salad dressed with homemade ranch dressing and roasted tomatoes. Folk Machine Pinot Noir to drink! Cheers! I would experiment with the stuffed pastas (tortillini/ravioli/etc.) and combine different sauces/veggies until I found the perfect combo! Yummy! I can’t wait to make this combination! Yummy! I would try this recipe. I think my family would be begging for more! I think I would make the recipe you posted! Looks yummy! Butternut squash ravioli with sage brown butter. I’d make Spinach Ravioli Lasagna with Pesto Panko Bread Crumbs. When I’m really hungry, I am so content eating a bowl of store-bought vegetarian ravioli with lots of marinara sauce on it. Your recipe sounds delicious! Or I’m always a softie for pesto! I’d love to try the rainbow three cheese tortellini. I’d use their alfredo sauce to make a chicken alfredo calzone. I’d probably use the raviolis to create a shrimp pesto ravioli dish! yum! I’d cook the tomato, basil and mozzarella ravioli with peppers, sundried tomatoes, onions, and provolone cheese. I haven’t come up with a name for it but it’s popular at my house. I would make your recipe except I would use pine nuts instead of hazelnuts, just personal preference. I think this is what we will have for dinner tonight – yum! Thanks for a great recipe. I would make vegetable tortellini soup with the tri-color tortellini. yum! I’d make four cheese tortilloni and marinara! The Monterey Gourmet Foods Product sounds delicious and your recipe looked so yummy! I would love to make the Roasted Chicken & Mozzarella Ravioli and Basil with Almonds & Pine Nuts Pesto Sauce. Can’t wait to try them! The Lobster Ravioli looks so good and with some Alfredo sauce it would make me very happy. I would make my favorite, lasagna. Your recipe looks delicious! I would like to try the pesto sauce on a pizza. I would love to make the Smoked Mozzarella & Artichoke Ravioli with a smoked mozzarella Alfredo sauce for my hubby. HE loved smoked cheeses and he loves artichokes! I’d make what you made. Not a recipe I’d think of putting together myself, but it sounds delicious! I would make a Pear Pesto Pizza. The flavor combination sounds amazing! I’d like to try the artichoke ravioli, with fresh herbs and browned butter! I would love to try this ravioli!!! It’s been awhile since I bought fresh pasta. These ravioli look fantastic! I would want to try this recipe or a similar one, something with a light sauce or light toppings, so that the ravioli really shine. I would make tortellini soup, and I’m dying to try the Butternut Squash with Orange Sage dough, sounds so yummy! other stuff, is there any other site which presents these kinds of information in quality? Of all the products, this ravioli would probably be it. From the pictures this is the one I was interested in. Even when going out to eat, will sometimes get a ravioli dish, although sure not as healthy as this one.